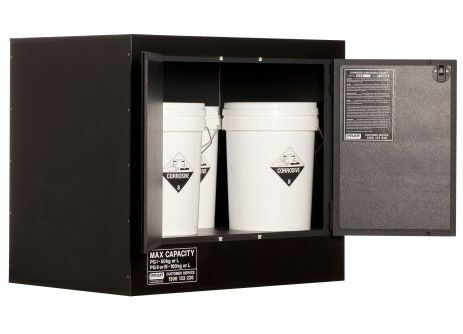 This cabinet is specially made from polyethylene plastic material, providing superior resistance for the storage of corrosive chemicals. These include chemicals such as Sulphuric Acid, Hydrochloric Acid, Nitric Acid and other substances highly aggressive to metal. Constructed with 19mm thick polyethylene plastic sheet material including frame, doors and shelves. Acid resistant liquid tight seal in all panel joints. Self-closing door with internal door opening latch. 150mm deep liquid tight sump. Self latching handle with key lock. Venting kits supplied with all models (may be fitted at installation if required).